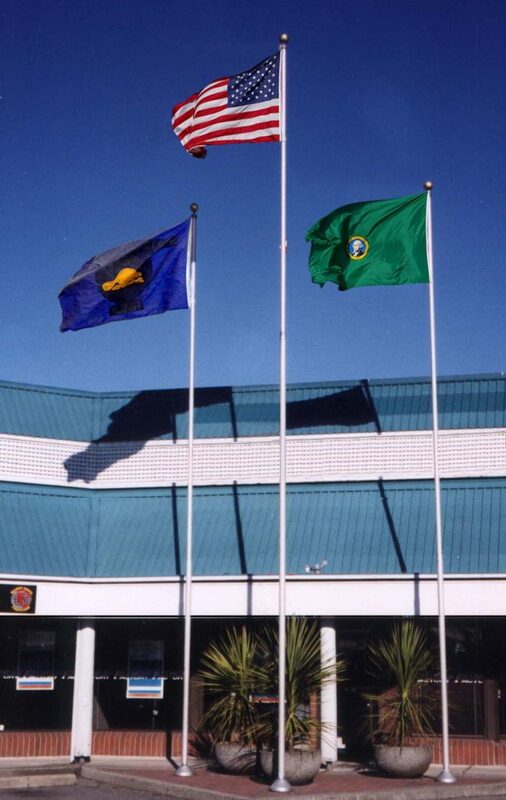 Flagpoles are an effective and economic method of attracting attention to one’s establishment. In order to achieve this, generally the maximum flag size is used. On the other hand, where prestige and a low profile image is being portrayed, we recommend flying the minimum flag size. Our flagpoles are step tapared and engineered for long life and beauty. We use 6063 T-6 Aluminum, which is standard in the industry. These poles have a clear anodized finish for that professional look (included in base price). Powder coating is an optional finish, please see the Cone Tapered flagpole page for pricing. The shield (included in base price) provides a clean, streamlined cover for the flagpole base. It is made of 6061 spun aluminum alloy and is finished to match the flagpole. Stationary Ball – included in the base price of the flagpole and is made of 14 guage gold or silver anodized aluminum. Revolving trucking ball (optional) – is used in conjunction with the internal halyard system. The revolving trucking ball is designed to rotate with the wind, and help minimize the flag from wrapping around the flagpole (all parts are non-corrosive). External Halyard (rope) – included in the base price of the flagpole. This halyard is exposed on the outside of the flagpole, and is made up of a high quality aluminum pulley, chrome cleat, 2-s/s snaps, 2 vinyl snap covers and quality 1/4″ dia. white double braided polyester rope. Internal Halyard (locking door) (optional) – comprised of: stainless steel cable, white plastic chain, ring assembly, flag cable with 2-s/s snaps and 2 vinyl snap covers, swivel, quick link, flush mount halyard door and cam lock. Tilt Base (optional) – this low profile tilt base looks like any ordinary base from an external view. It can also allow one person to erect the flagpole and features security for the flag and easy maintenance for the flagpole. The most effective way to attract nighttime attention to your flag and flagpole is by using a ground-mounted light. A floodlight may also be mounted on flagpoles in order to add security to your property. See lighting page for pricing. The concrete used to install the flagpole foundations is 40 MPA 1/2″ aggregate. Note: see spec page for concrete foundation. Installation instructions may be downloaded from our website here.